This might be God’s greatest attribute, not to diminish all His other attributes but this is the only attribute of God, anywhere in the Bible, that mentions one of His characteristics three times and that is He is “Holy, holy, holy.” Perhaps it’s because there is one “holy” for each of the Three Persons of the Trinity. I don’t know, but I do know that never is it said that God is “love, love, love” or “merciful, merciful, merciful” although He is certainly all of these but God is holy above all things and the earth is full of His glory, whether people know it or not. This may be the best known Bible verse in the Bible but you might ask why. Surely it’s because it shows the character of God and the character of God is certainly love “because God is love” (1 John 4:8). The love of God is evident “because God’s love has been poured into our hearts through the Holy Spirit who has been given to us” (Rom 5:5). The Bible proves that “God shows his love for us in that while we were still sinners, Christ died for us” (Rom 5:8) and even “while we were enemies we were reconciled to God by the death of his Son, much more” (Rom 5:10). Love is a verb; it is what you do. Look at the cross! Since we know that Jesus is God (John 1) then since Jesus never changes, neither does the Father or the Holy Spirit. Malachi records God saying of Himself, “For I the LORD do not change; therefore you, O children of Jacob, are not consumed” (3:6). Not only aren’t the children of Jacob not consumed, neither are we! God never has an “oops” moment or “oh no!” happen. He is perfect in every way so He has no need for change. You cannot improve on complete, absolute perfection. Can you even imagine God waking up in a bad mood? Nope, God never sleeps and God is always the same. Has it ever occurred to you that nothing has ever occurred to God or that nothing has ever “dawned” on God? God is sovereign, even over the tiny sparrow that falls to the ground (Matt 10:29). The tiny sparrow was the smallest animal sacrifices of all and was the only option for the poor so maybe God is telling us that even a sparrow doesn’t go unnoticed just like the poor do not escape God’s attention. He is sovereign over everything that happens and even though we might think we’re in charge, “it is God who executes judgment, putting down one and lifting up another” (Psalm 75:7). In an amazing Bible verse that I don’t ever remember reading before, it is said of God, “He raises the poor from the dust and lifts the needy from the ash heap; he seats them with princes and has them inherit a throne of honor. “For the foundations of the earth are the LORD’s; on them he has set the world” (1 Sam 2:8)! Only a sovereign God can say that. God is always faithful to His Word and “all the promises of God find their Yes in him. That is why it is through him that we utter our Amen to God for his glory” (2 Cor 1:20) and the angel in speaking of Jesus Christ said “These are the words of the Amen, the faithful and true witness, the ruler of God’s creation” (Rev 3:14). Even today, will God remain faithful to His people? Paul writes “For I tell you that Christ became a servant to the circumcised to show God’s truthfulness, in order to confirm the promises given to the patriarchs” (Rom 15:8) but of course, they must come through Jesus Christ and not by bloodline (John 6:44; Acts 4:12). In this great prayer or psalm of repentance, David asks for God’s mercy to blot out his sins “according to [God’s] steadfast love.” Was David worried about his salvation? No, as he writes “O Lord, you will not restrain your mercy from me; your steadfast love and your faithfulness will ever preserve me” (Psalm 40:11) so thankfully it “depends not on human will or exertion, but on God, who has mercy” (Rom 9:16). This is one of the most beautiful verses in the Bible. It is God Himself speaking to Moses as if to a friend; He speaks to us in these words too, thousands of years removed from it. God is good and He is good all the time and even brings good out of evil (Gen 50:20). Part of His goodness is His mercy and graciousness. God freely gave us the gift of grace through faith by Christ and there was nothing we could do to earn that (Eph 2:8-9). 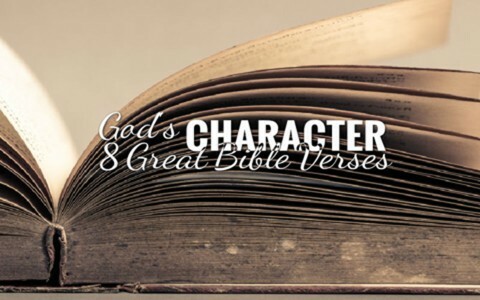 It is impossible to limit God to only eight characteristics but these are among those that may be more evident. God is so many other characteristics that even a book could not contain them all. He is most assuredly holy; He is obviously love; He is the same, forever. He is absolutely sovereign over all things; He is faithful and never leaves us or forsakes us (Heb 13:5). He is a Just Judge and all justice will be perfectly administered by Him; He is ever and always an abundantly merciful God; and God is so good…all the time. Learn to praise God in the storms as well as in the calm in life for He is supremely worthy. I don’t know if you remember me, but I came here quite a lot and asked questions and clarifications. I also asked you about how to find a good church, and I’m going to a church after 2 weeks! I’ve been having some concerns lately, but when I depended on God and prayed, it took some time but I felt a lot better and more positive. After that, I really decided I wanted to go to a church and pray and participate in good activities. So I asked my Christian friend and now, I’m going to her church! I don’t know if it will be good, but if it is, then I will sure to do a lot of Bible study and church work. It’s a small church, but it doesn’t matter if one is big or not right? Some people told me a bigger church might be better. I will look over how to find a good church again to make sure the one I go to is a good one. I wanted to write something more, but this is all I can think of. Thanks for giving me good tips and I will continue to visit this site. Thank you, and I hope you have a great day/evening! Next post: Did Humans Exist With God Before They Were Born On Earth?